Well, there you have it people. Why bother trying to get the fans’ little faces puffed up with pride when you’re only going to slap them with the cold fish of fear? None of us want platitudes, but given the rarity with which Evans addresses the masses, it might have been nice to start on a slightly more unifying note. Instead, an opening so stark that it can only have been deliberately constructed as such, brought to mind Gareth Southgate’s famous appraisal of Sven-Goran Eriksson’s 2002 World Cup quarter-final team talk: “We needed Churchill but we got Iain Duncan Smith”. In paragraphs which may yet form the basis of a chapter in a future management textbook on Managing Stakeholder Expectations, Marcus goes to significant effort to contextualise the club’s financial position, yet strangely fails to mention the ever-growing debt that is presented in each year’s accounts. 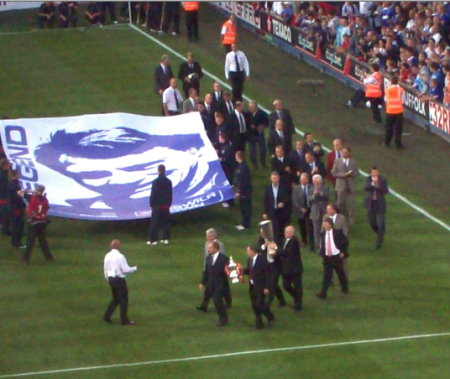 A prudent approach is all very well: most supporters wouldn’t want the club to indulge in the sort of profligate spending that has seen the dramatic downfall of others (though it does beg the intriguing question of what would have happened if Marcus had been successful in his reported attempts to install Harry Redknapp in the manager’s office). But any true appraisal of the sustainability of the club’s situation would surely have to acknowledge the increasing amount of red on the balance sheet. In seeking to mitigate the gloom, Marcus asserts that “We have an Academy stronger than many. … Our Academy advantage over others will remain”. It’s nice to see the Academy recognised as a plus point. Unfortunately, the act of saying that ours is better than most other clubs’ doesn’t make it true, even if it’s “the big M” (© Nigel Pickover) who’s saying it. There’s nothing to indicate that our Academy is any better resourced than those of our Championship rivals – and it’s interesting to note how many young coaches and players are opting for what’s on offer down the A12 at Colchester. The once-famed “conveyor belt” of talent into the Town first team has stuttered and halted, to the point where Mick McCarthy recently observed that there were no young players “knocking down the door” of the first team. Having given us all a further stern talking-to on the subject of money, Marcus moves on, 20 paragraphs into a 23-paragraph article, to acknowledge the existence of supporters in a tone that sounds more like bemusement than appreciation. Having made reference – with a notable lack of any tribute – to the recent departure of Simon Clegg, Marcus reassures us, with regard to “receiving and taking account of [fans’] views”, he’ll be “assessing any void that has appeared through Simon’s departure”. Now this, if analysed too closely, could constitute some kind of philosophical paradox. Can the absence of a vacuum leave a void? Clegg’s approach to supporter engagement has been discussed extensively on these pages, in the first issue of Turnstile Blues, and elsewhere. Cursory at best, patronising at worst, Clegg was never in danger of receiving one of those worthy “supporter liaison” gongs that get handed out by Mark “Clem” Clemmit at the Football League Awards. (Perhaps avoiding that was always his aim). So if Marcus is as motivated by cost-cutting as he says he is, then any “void” in communication with fans left by Clegg’s absence could easily be filled by, say, a gargoyle, or one of those cross-looking proboscis monkeys. Of more merit would be a commitment to refresh the club’s approach to supporter engagement, rather than viewing it – as Evans’ article appears to suggest that he does – as a box to be ticked. It’s been well over a week since Grant Bage wrote on these pages an eloquent, passionate, measured piece, describing the real “void” that exists at Ipswich Town – the owner’s lack of visibility – and politely invited a response from Evans. At the time of writing, despite the piece having been sent to both ITFC and MEG, we’ve yet to receive one. Once again, when it comes to meaningful engagement with fans, Evans’s silence speaks volumes. That noise you can hear – it’s not the business-like hum of an efficiency-centred culture. It’s Bobby Robson, turning in his grave. Hi Pete, very good points. As has been said before, Evans has never satisfactorily explained to fans what his long-term plan is – or more specifically, how he’s going to achieve it. In the absence of that, the general uncertainty, compounded by Evans’ anonymity, can only grow. So assuming that ME does not reply and continues to be uninterested in the fans or the community, what next? I’m replying with my own personal thoughts, which may or may not be representative of others who are involved with Turnstile Blues. 1. Carry on as we are: still going to the games, paying our money, being a bit unhappy about things but putting up with it on the basis that “at least we’re not Portsmouth” or similar. 2. Carry on as we are whilst offering as many challenges / dissenting voices to the current ITFC administration as possible – through fanzines, blogs, direct communication with the club, representations to official supporters club, etc. Effect (in terms of forcing change) probably negligible. 4. Give up and walk away. 5. Give up on Evans and collaborate in the formation of an “AFC Ipswich”-type alternative club, reclaiming it for the supporters. The more radical of these options are appealing to me (again, a personal view), but I’m not convinced that there is – yet – sufficient appetite for change and resistance amongst the wider group of supporters. My aim in writing blogs like this one, and I think the aim of others who write for TB, is to try and encourage other fans to take a more critical/analytical view – to be aware of the risks of our current ownership model and consider alternatives. But that, in terms of affecting real change, is very much a proverbial drop in the proverbial ocean. What do you think about the “what next” question? What do others think?